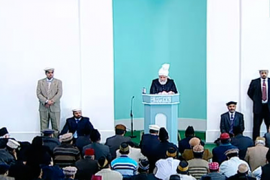 After reciting the Tashahhud, Ta’wwuz, and Surah Al-Fatihah, Khalifatul Masih V (aba) stated: In the previous sermon, I spoke about the status, the virtues, and the examples of the companions [of the Holy Prophet (sa)], may Allah be pleased with them and today I will continue on the same topic. One of the august companions of the Holy Prophet (sa) was Abu Ubaidah bin al-Jarrah (ra). Being a companion, he definitely enjoyed a certain status. He possessed many qualities. The authoritative verdict, which the Holy Prophet (sa) has passed regarding his being a man of trust, has been narrated in the the following manner: When a party from Najran, asked for someone to be sent to collect the taxes from the people of Najran, the Holy Prophet (sa) said that, ‘I would definitely send to you a man of trust, a man of trust in the true sense of the term.’ He then asked Abu Ubaidah ibn al-Jarrah (ra) to stand up and ordered that he be sent there. The Holy Prophet (sa) said that, ‘Every nation has a custodian, and o ye people! The custodian of ours is Abu Ubaidah bin Al-Jarrah.’ How great an honour this is, which the Holy Prophet (sa) conferred upon him. During the Battle of Uhud, some of the stones thrown by the enemy hit the Holy Prophet (sa) and two iron rings of his helmet, which he was wearing over his face, broke and pierced his blessed face. It was Hazrat Abu Ubaidah (ra), who then pulled out those rings from the face of the Holy Prophet (sa) with his teeth and in the process, lost two of his front teeth. Thus, this is one of the incidents of love and devotion. The companions say that loss of front teeth only increased the magnificence of the face of Abu Ubaidah bin al-Jarrah (ra). The incident of his humility, mutual cooperation and the settling of a matter with wisdom is narrated in this manner that on one expedition, the Holy Prophet (sa) sent ‘Amr bin Al-‘Aas (ra) as the chief of the army. Amr bin Al-‘Aas (ra) requested the Holy Prophet (sa) for reinforcements. Subsequently, the Holy Prophet (sa) sent a group under the leadership of Hazrat Abu ‘Ubaida (ra) and the Holy Prophet (sa) instructed Abu ‘Ubaida that both leaders should mutually work together. However, there was a misunderstanding as ‘Amr bin Al’-‘Aas (ra) thought he was the leader of both units and this led to some confusion in Hazrat Abu ‘Ubaida (ra)’s unit. Despite being appointed as an independent leader, Hazrat Abu ‘Ubaida (ra), offered his full co-operation to ‘Amr bin Al-‘Aas (ra) and did not argue the point that might have led to more disagreements. Thus, this is an example of making the right decision on a delicate occasion and giving up even one’s own rights in order to strengthen the Muslims. Only if Muslims leaders would have enough wisdom to work with mutual cooperation. Furthermore, examples of running the government with justice and how to captivate the hearts of even the enemy can be found in the character of Hazrat Abu ‘Ubaida (ra). When the king of Rome gathered armies from across the entire country and sent them in order to fight Muslims, after consulting the generals, Hazrat Abu ‘Ubaida (ra) strategically decided to leave some cities for the time being; to leave the areas which Muslims had already conquered. However, as they had already received taxes from the non-Muslim inhabitants after the victory, he returned it to all of them saying that as we are unable to protect you for the time being and are unable to fulfil your rights, we are returning the sum which we had received as taxes from you. This justice and repayment of a trust had such a great influence on non-Muslims that the Christian residents were weeping at the departure of Muslims and offered this heartfelt prayer that may Allah soon bring you back. These were the people who, as a result of living in the company of the Holy Prophet (sa), established those standards of fairness and justice, which no one could imagine before, nor can anyone do so today. To guarantee peace in the world today can only be achieved through this fairness, justice and fulfilling the rights of trusts. However, this cannot be established by the more powerful governments coercing weaker governments to act in accordance with their demands by threatening to take action against them. Neither can this be established through what is taking place in many Muslim countries, where taxes are being collected from the general public, but instead of spending it on them, most leaders are filling up their banks. Yet, they raise slogans of love for the Holy Prophet (sa) and love for his companions. Then, there is Hazrat ‘Abbas, who was the paternal uncle of the Holy Prophet (sa). He was well known for his generosity and kindness. The Holy Prophet (sa) said that ‘Abbas is the most generous and kind person from among the Quraish. Upon hearing this, Hazrat ‘Abbas freed seventy slaves. These were standards of the generosity of these people. Then, there is Hazrat Ja’far (ra), the paternal cousin of the Holy Prophet (sa) and the blood brother of Hazrat ‘Ali (ra). He was also fortunate to have accepted Islam in the early period and as a result of the circumstances in Mecca, he migrated to Habesha [Abyssinia]. Makkans complaints to Najashi, who was the king of Habesha [Abyssinia] and demanded the return of these new Muslims. At this Najashi, called the Muslims to his court and Najashi asked them that what is the reason for leaving your faith and neither accepting the faith of a previous nation, nor that of ours i.e. Christianity. On that occasion, Hazrat Ja’far (ra) represented the Muslims and said that o king! We were an ignorant people. We used to worship idols, eat dead animals, it was our common practice to commit vulgar acts and mistreat our relatives and the one who was more powerful among us would suppress the one who was weaker. In these circumstances, Allah the Exalted raised a prophet among us, whose nobility, truthfulness, trustworthiness, purity and the nobility of his family we were well aware of. He called us towards the unity of God and towards His worship. He taught us not to associate anything with God and neither to worship idols. He taught us to be truthful, trustworthy, kind, treat our neighbours with kindness and he forbade us from fighting and shedding blood without reason. He taught us to abstain from immoralities and he forbade us from telling lies, usurping the wealth of orphans and raising allegations against chaste people. He instructed to us to worship God alone. We have accepted him and we act in accordance with his teachings. Due to this our nation has turned against us and has caused us pain, inflicted cruelties upon us. Furthermore, when this exceeded all bounds, we left our homeland and came into your protection as we heard great things about your fairness and justice. O king! We hope that no one will be unjust towards us in this country. Najashi was greatly influenced by this and said that read to me a portion of the revelation that was sent down upon your prophet. Upon this, they recited several verses from Surah Al-Maryam and they did so in such a melodious manner that filled the eyes of Najashi with tears. He said ‘By God it seems that these words and the words of Moses are from the same fountainhead’ and he told the ambassadors of Mecca that he would not return these people to them and they can remain here. After consulting one another, the Makkan ambassadors devised the plan to tell the king that these people do not believe in Jesus in accordance with Christian teachings and lower his status. The king then summoned the Muslims and asked about their view on Jesus. Hadrat Jafar replied that it has been revealed to our Prophet that Jesus was a servant of God and His Messenger whom God Almighty granted to the Virgin Mary. King Negus then picked up a straw from the ground and said that the status of Jesus was not more that this straw’s-length from what you have just described and then told the Muslims that you have complete freedom here. Due to his wisdom, understanding and knowledge the Muslims were provided with the means to live there. Another companion was Musab Bin Umair (ra). His mother was very wealthy. They were a very wealthy people brought up with luxuries. They would wear very noble clothing and he was a very handsome young man. Musab Bin Umair (ra) faced financial destitution after he accepted Islam, that he suffered much affliction in the way of Allah. Once Musab arrived at the sitting with the holy Prophet (sa) in a state that he was dressed in rags, and said Salam, the Holy Prophet (sa) gave a whole-hearted reply and consoled him by saying, All praise belongs to God, may those who endeavour for worldly possessions be granted those. I have seen Musab at a time when there was no one more affluent than him in the city of Mecca. He was the most beloved child of his parents, he was provided with all the best things to eat and drink, but his love for the Messenger of Allah brought him to these circumstances and he sacrificed all that for the pleasure of God Almighty. Then God Almighty granted him light in his countenance. Musab Bin Umair (ra) was very skilled in preaching and would do so with great love. He would often tell those preaching that if what I say to you pleases you then listen, if not then do not listen and you may leave. In this way he would convey the true message to others in Medina and through his preaching many people accepted Islam. Hadrat Saad Bin Rabi’ (ra) was an Ansari [i.e. those who lived in Medina]. After migration to Medina, when the Holy Prophet (sa) initiated the programme of establishing Muwakhat [i.e. a bond of brotherhood between those who migrated and those living in Medina] the Holy Prophet (sa) appointed to him Hadrat Abdur Rahman Bin Auf as a brother. Hadrat Saad Bin Rabi’ (ra) brought his newly appointed brother to his home and took great care of him as a guest and offered him half of his every possession. Hadrat Abdur Rahman Bin Auf replied that this is indeed a befitting expression to your great faith, that may your wealth, property and wives be blessed for you, may Allah bless them in abundance. I am a tradesman and will be able to take care of myself so just tell me the direction to the market. I thank you for your sentiments. In this way he began trading and there came a time when he was amongst the wealthiest of traders where he was earning hundreds of thousands. Hadrat Saad Bin Rabi’ (ra) also took part in the Battle of Uhud and was martyred in it. He sent this last message to the Holy Prophet (sa),”It seems I will not survive so tell him ‘O Messenger of Allah! However, many Prophets have passed, however much they were delighted by their people, may Allah make it so that you are delighted much more with us.’ Also, he conveyed this message to his fellow Muslims that as long as the Holy Prophet (sa) is among you it is your duty to safeguard this trust. Always remember that as long as there is even one of you alive and you have fallen short in protecting this trust then God Almighty will not accept any excuse on the Day of Judgment. Hadrat Usaid Bin Huzair Ansari (ra) would used to seek three high spiritual experiences. To attain the same state of awe of God at all times, that is experienced when reciting and listening to the recitation Of the Holy Quran; to attain the same state of commitment at all times, that I experience when listening to the advice of the Holy Prophet (sa) with full concentration and to attend a funeral as if it was my own funeraland I am being held to account for my deeds. This is a sign of his complete fear of God and it is this very state which brings man to fear God and continue making efforts to carry out good deeds. He remembers God at all times and at all occasions. Another quality of Hadrat Usaid Bin Huzair Ansari (ra) was his deep love for worship and prayer. He was the Imam of the mosque in his area. Even in sickness he would come to the mosque to pray. At times when it became difficult to pray standing he would still come to the mosque to not miss out on the blessings of the prayer in congregation. Hadrat Usaid Bin Huzair Ansari (ra) showed total obedience to the two Khalifas; Hadrat Abu Bakr Siddiq (ra) Hadrat Umar (ra). He passed away during the Khilafat of Hadrat Umar (ra). Hazrat Abi Bin Kaab (ra) was a practising scholar and would regularly perform the five daily prayers behind the Holy Prophet (sa). Hazrat Abi Bin Kaab (ra) relates that the Holy Prophet (sa) said that the two prayers of Fajr and Isha are very difficult for the weak of faith and the hypocrites. If they knew just how many blessings are in these two prayers, then they would attend them even if they had to crawls on their knees. There are also various narrations of his in regard to resolving issues. He explained that if a lost property is found, its owner will be actively sought for 3 years before bringing this in one’s personal use. Thus, this is the standard of Taqwa [God-fearing righteousness]. Hazrat Abi Bin Kaab (ra) relates that the Holy Prophet (sa) stated, ‘if you recite the Durud for the most part of your supplications then God Almighty Himself will take care of your worries and grief. Your sins shall be forgiven and in the eyes of God this will become a means of elevating your station.’ Hazrat Abi bin Ka’ab (ra) was a very learned man and had great knowledge of the Holy Quran. His gatherings would always be filled with great intellectual discourse. In short, he had a very eminent and high status. The grace of these great companions continues today and we are deriving benefit from them. In Sirul-Khilafa, the Promised Messiah (as) states: (it is in Arabic and I will read its translation). Allah have mercy on you. Know that all the companions were like the body parts and limbs of the Holy Prophet (sa) and the pride of all of mankind. Some of them were like the eyes of the Messenger of the Merciful God, some like ears, some like hands and others like feet. Whatever these companions did, or whatever efforts they made all issued forth in likeness with these body parts and they did these solely for the sake of pleasing the Lord of the universe and the Lord of all the worlds. May Allah the Almighty enable us to follow in the footsteps of these bright stars, thereby making us those who love the Holy Prophet (sa). May every action of ours be done for the sake of God Almighty. After the prayers I will lead a funeral prayer in absentia of Mrs Areesha Dephan Thorlar Sahiba, wife of Fahim Dephan Tholar Sahib from Holland. Recently she was living in Benin. She passed away on 11th December in Benin due to sudden heart failure, at the age of 62 years. [Arabic] To Allah we belong and to Allah shall we return. She was very hospitable and would show a lot of love and compassion to the local people. It was due to this love and compassion that all the people in her locality of Benin would call her “Mama”, and would seek her advice in their personal matters. May Allah the Almighty elevate the status of the deceased and shower his mercy and forgiveness upon her. May God Almighty grant the Jamaat such loyal devotees like her, who understand the spirit of devoting one’s life for the Jamaat.